9mm Luger lovers will really enjoy these remanufactured rounds from MBI (Military Ballistic Industries) for their affordable cost and high degree of quality. These factory reloaded rounds utilize well-made components including Berry’s bullets, non-corrosive Boxer primers from Winchester or CCI, and clean-burning powder from Hodgdon. All of these ingredients come together in once-fired brass casings that have been inspected for splits, dents, and defects before being tumbled to a polished sheen. The bullets used in this load are 115-grain copper-plated projectiles from Berry’s. 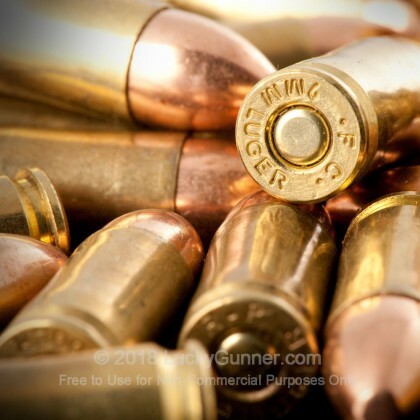 Unlike cheaper alternatives, Berry’s copper-plating is rated for high speeds and pressures and will prevent excess lead fouling so long as they aren’t fired through a ported barrel. The projectiles bear a round nose shape which feeds excellently in any action. At 115 grains, these lightweight rounds match a plethora of 9x19mm ammunition choices for both practice and carry use. Not only did I receive the ammo the next day, but it shoots great out of my Nano. No problems whatsoever out of about 80 rounds. I just received an order of this stuff in .40 cal today and can't wait to try it out in my new ( at least new to me) P226 Sig. Good Quality ammo, noFTF or FTE, don't like the price going up though. No problems at all. Shot great. I am always on the hunt for a good source of quality ammo at fair prices; excellent value, fast deliver, I'll keep buying and recommending. This ammo is quite low power. I get a lot of stove pipes. I also had a completely cracked casing from end to end after firing, which could have been dangerous. I wouldn't buy this again. Ammo is accurate and an excellent deal! LG is the best game in town! 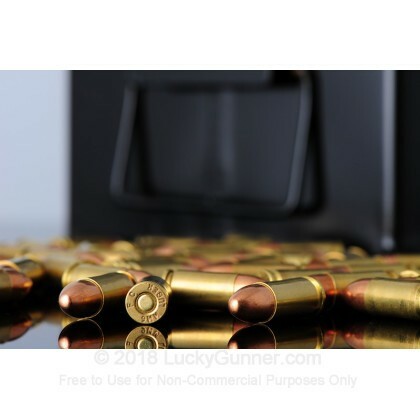 I ordered 500 rds of the 115 gr 9x19 for my 9mm fmily of glocks to practice with at the range. Today at the range I brought along 100 rds of the MBI and 200 rds of some other stuff (Blazer) to shoot through my Glock 17. As far as accuracy goes it was fine, not match grade but good enough for practice. However after about 10 rds I had a failure to fire. I racked the slide and the round ejected. I looked at the primer and noticed it had a light strike. I put it back in the mag tried it again and it fired fine. After about another 40 rds I had another failure to fire. Again it was a light strike so I repeated what I did earlier and it fired the second time around. I know it isn't my weapon b/c I deep clean (break down the gun all the way/all moving parts removed and scrubbed) after every trip to the range or competition. Not really sure what caused this but 2 failures out of 100 rds just doesn't cut it for me. I use Magtech and American Eagle for competition/ training and have never had an issue with either of those and I have fired over 2,000 rds of those so far this year. I was looking for a more economical round to practice with and this isn't it. I think I will stick with Magtech, AE, or Atlanta Arms from now on. I bought 300 rounds of MBI and all ran thru flawlessly on my Kahr CM9. It is good value and was not nearly as dirty as the WWB I normally shoot. I will be ordering more for sure. Only shot about 100 rounds so far, but no FTFs, FTEs, or accuracy issues. Even with shipping costs, well worth the price! I am a novice, just started shooting several months ago. But I am a research geek, so after reading the reviews on Lucky Gunner I purchased 2 seperate items. I have run the entire 100 rounds without a single issue. Thank you for the value, even with shipping still much cheaper than buying at the range. No misfires, no misfeeds. This shot great and I have just bought another 100 rnds. I've shot 200 rnds with no problems at all. This will continue to be my range ammo! No misfires, shoots great! I have bought this twice, and will buy some more. Come to think of it, I'm on the site now . . . great idea! No failures of any type - as clean as any of the name brands. Loads, goes bang and ejects - great practice ammo. No FTF in my Beretta 92F or Glock 26. Clean Guality and good price. Great price, great service and fast delivery. Ran 100 rds. thru my Beretta 92FS without any hickups. I used MBI ammo this year at the Carolina Cup in Oxford, NC as well as several other IDPA matches, and after a couple thousand rounds, NOT ONE problem related to the ammo. It shoots really clean, too. For the money, these can't be beat. I will definitely be ordering MBI ammo from Lucky Gunner again!! Took my Glock 19 out to the range today to try out the Military Ballistics Ind. ammo. It far exceeded my expectations. Not one problem. 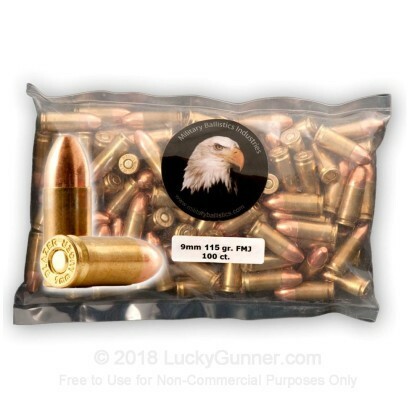 This is a good deal in ammo. Not one issue with my first bag! Will definitely buy more!!! Bought 500rds and I am going to buy another 1000! I have yet to shoot any of these rounds, but upon inspection they apear to be fine reloads, as long as they are not to dirty and my XDM eats them I will order the 1000 round 124 FMJ. The only issue I had was shipping it took all of seven days to get these. I ordered for a competior and got them in 2 days and shipping was cheapier. I've sent 200 rounds down range from my Glock 19. The ammo preformed flawlessly no fte or ftf. Quality product for a decent price. Great value and flawless performance! Went through the first 500 rounds with my 92FS and didn't have a single issue. Now I'm working on my second order of 500 rounds. I've been buying reloads at the local range so I wasn't really concerned about them being reloads. The price is great, and I haven't found any cracked casings. Well worth the money! I have read a lot of reviews online about this product, and the good outweighed the bad so I decided to try it. Me and my buddy ordered 200 rounds to try and upon receipt we very impressed with quality and performance. Not one corroded or split casing and nothing i wouldn't fire. As for performance they were wonderful, not one misfire or squib load. So we returned from the range and ordered 1500 more rounds. So we say don't trust the skeptics on other sights try a bag for yourself. The product speaks for itself. I knew it was reloads when I got it, but I had expected less performance issues out of it ... not bad for range ammo I guess but I'll probably be looking for something a little more reliable. This ammo is great for the money.Out of a bag of 100 found one split casing,it's worth checking them out carefully before loading,makes the day go a lot smoother.Again for the money the ammo is a quality reload product.These rounds were fired through a Springfield XDm 3.8 pistol. I fired 200 rounds through my Sig 226. Very clean and accurate rounds. Bought 100 rds to test out in my 24/7 Pro DS at the local outdoor range. I can say I'm very satisfied with how this ammo shot. I had a box of WWB 100ct and 100 ct of MBI. I ran the MBI through first, all 100 rds went down range without a hitch and shot pretty clean compared to the WWB stuff which shot very dirty. Not a single FTF or FTE. For the $$ I think i'll stick to the MBI from here on out for range ammo. 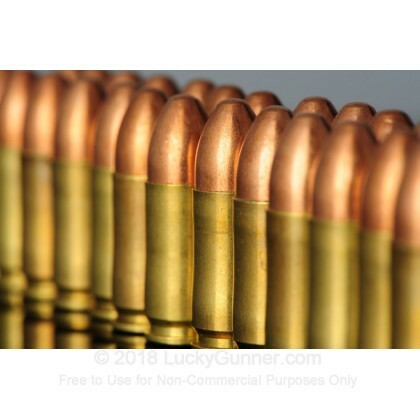 This is great ammunition at a great price. I've gone through 200 rounds in my Sig P229 without a single problem. I'll be buying more in the future! Good quality, very clean and accurate. Zero FTF and FTE. Didn't realize they were reloads till I started shooting but they shot well with no FTF or FTE's. I bought this to use for practice as well as IDPA, it was better than I expected. On my second 1000 round case. Very happy with product, Will buy from again. Had no problem, relatively clean burning. I liked it. Ammo shoots well. Definitely a good buy for your buck. Not one misfire, but I did have a couple misfeeds. Great Ammo for the price! Quality is much better than expected. I couldn't ask for more. Quality was equal to most factory loads. Price is unbeatable. Very happy with this product. No problems what so ever. Great Target Ammo. Fired 200 rounds through my XD sub compact without a single malfunction. Fires clean and accurate everytime. This is excellent ammo. I use this round at the range and am very happy with it. Good target round. I'd recommend. I bought the 400 rounds of the ammo because of the price. I shoot some IDPA and just plain "target shoot". I was not disappointed in the performance. I had not mis-fires or mis-feds. I am happy with the product.